The tender twig and leaf of evergreen macrophanerophytes of Platycladus orientalis (L.) Franco of family Cupressaceae. Mostly in summer and autumn. Fragrant smell, bitter, astringent and a little pungent taste. Tender leaves with light green color and no crushed pieces. Discarded thick twigs, purified and dried in shadow; unprocessed or stir-baked into charcoal. Bitter, astringent cold; lung, liver and spleen meridians entered. Cool blood and stop bleeding, resolve phlegm and stop cough. 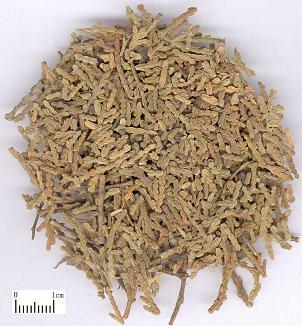 This herb is bitter, astringent and cold in nature, good at clearing blood heat. It can also astringe and stop bleeding. Therefore it is quite effective to various bleeding especially caused by blood heat. For hematemesis and epistaxis due to recklessly blood flow due to blood heat, it is always combined with other heat-clearing and blood-cooling hemostatics. For instance it is combined with He Ye, Di Huang, etc. from Jiao Zhu Fu Ren Lian Fang. The juice of these fresh herbs is pounded out and taken orally. For deficiency-cold bleeding, it is also combined with the interior-warming and cold-dispelling herbs. For example, it is combined with Gan Jiang and Ai Ye in Bai Ye Tang from ]in Kui Yao Lue, indicated for deficiency-cold middle qi with signs of constant hematemesis. Being bitter and cold with actions of clearing and purging, it is good at clearing lung-heat and resolving phlegm, and stopping cough. 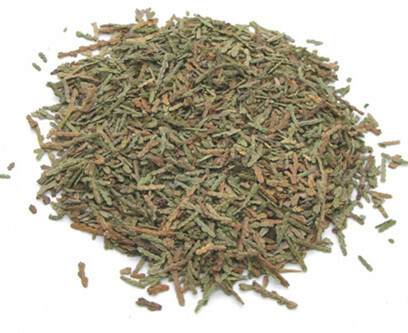 For cough and dyspnea caused by lung-heat accompanied by thick and difficult expectorating sputum, it is used singly or combined with heat phlegm-clearing and resolving herbs and antitussive and antasthmatics, such as Bei Mu and Zhu Ru, etc. In addition, for injuries due to hot liquid or fire, and alopecia, it is applied externally. Decoct 10~15 g. Proper dose for external application. When stopping bleeding, stir-bake it into charcoal; when resolving phlegm and stopping cough, use the unprocessed.